People with AIDS are among those who stand to lose as a result of free trade agreements that include "intellectual property" rules that limit access to affordable generic drugs. 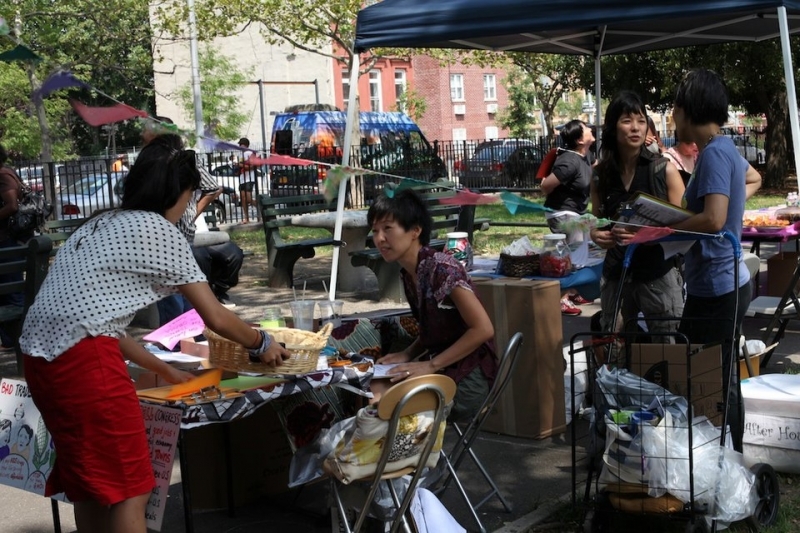 TradeJustice New York Metro brought this message to the LGBTQ community on Sunday, August 21 at the First Annual Bed-Stuy Pride in Von King Park in Brooklyn, where we ran an information table with our friends at Nodutol for Korean Community Development. Members of Global Justice for Animals and the Environment, the NY Committee in Solidarity with the People of El Salvador, Health Global Access Project, Brooklyn for Peace, Queerocracy, and other groups joined us to petition, flier, answer questions, and to encourage attendees to urge Congressman Ed Towns to vote against the Panama, Colombia, and South Korea Free Trade Agreements. Flier: Congressman Ed Towns: Don't Sell Out Again on Free Trade! Flier: Representative Towns: Oppose Free Trade Agreements That Deny Access to AIDS Drugs and Other Life-Saving Medicines! Petition Card: Stop Free Trade Agreements That Limit Access to AIDS Drugs and Other Life-Saving Medicines!